Truth be told, I was planning to post this with just the monochrome photograph — I like it better. But upon looking at the color, I thought it worthwhile to present it to you, for your consideration. 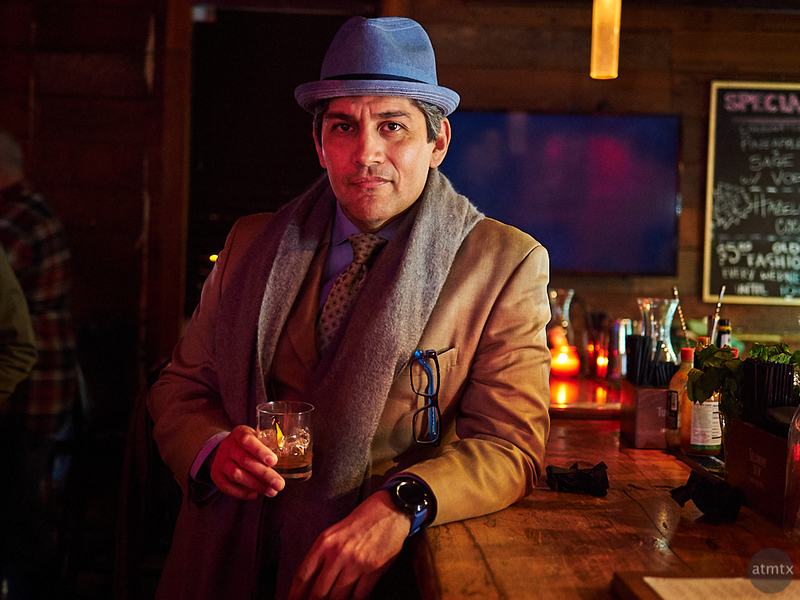 The color version has some mellow warm tones and Hector looks so nicely dressed, with touches of blue, that shows off his coordinated, sharp dressing. All this is lost with the black and white, of course. With Hector by the bar, with drink in hand, this almost looks like an ad for whiskey. I have to admit that there was no special lights setup to achieve this. Most everything is lit by bar light. Some light post processing created what I was going for. I lifted some shadows on Hector’s face and clothing (aka dodging). I then darkened the background, slightly (aka burning). I did similar processing on both the color and black and white versions, but separately. There’s a much steeper tone curve on the black and white, which creates more contrast and shadows. All of these changes were done courtesy of Capture One, which has really given me new-found post processing powers. I much prefer the colour version. Hmm…usually I prefer the black and white versions of photos, but for me, I have to say I prefer the colour version here! Feels slightly more dynamic and pops a bit more. Or maybe stands out is a better phrase. Yes, and I think the color version, in retrospect, has more character. Best of the bunch. The color version is way ahead of the B&W. And you’re right: it’s an ad layout waiting to happen. A damned good one, too. Thanks, Mike. The consensus seems to be a preference for the color. Glad I shoot with both so that I have options.